Corn planting for much of Kentucky is quickly approaching. Given the mild winter, average soil temperatures across Kentucky for the month of March are approximately 51°F. This is similar to last year’s average soil temperature of 52°F for the same period (March 1 to 25). However, it is several degrees warmer than the 10-year average of 48°F. 1. 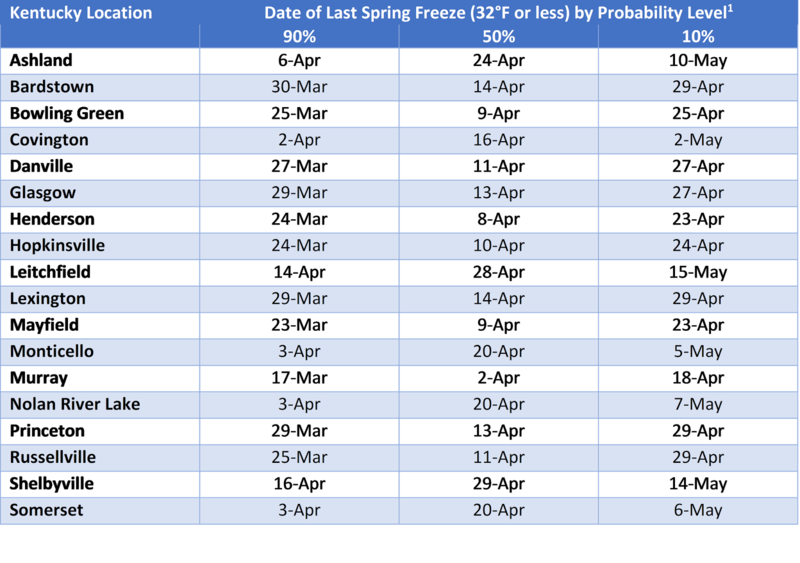 The risk of the last spring freeze ranges from April 2 to April 29 in most years (50% probability; Table 1). 2. Soil temperatures need to be at least 50°F at a 2-inch depth for three to four consecutive days, with the expectation that temperatures will remain 50°F or greater. Table 1. 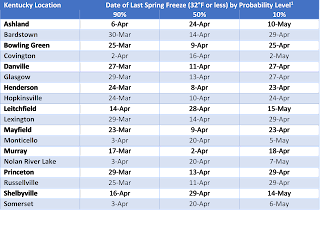 Date of last spring freeze by probability level. 3. Soil conditions and summer precipitation generally has a much greater effect on final corn yield in Kentucky than planting date. For example, in Central Kentucky the planting date with the greatest yield was April 10 in 2005, May 29 in 2010 and May 31 in 2011. 4. Consider plant populations for different soils. University of Kentucky recommendations for corn seeding rates are now based on soil productivity (Table 2). These productivity levels are based largely on the risk of a soil running out of water during the growing season. Deep soils with large water holding capacity can handle higher plant populations than sloped, eroded soils prone to drought. Table 2. Recommended corn seeding rates for Kentucky. 5. Be sure to fertilize to university recommendations, based upon soil test results. 6. Avoid conditions that would result in soil compaction. 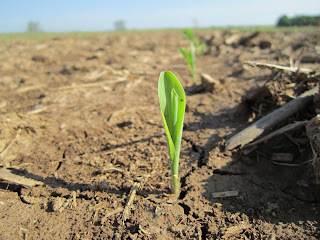 Annually, soil compaction reduces corn yields much more than expected and in most cases can be avoided by waiting an additional day or two before planting.